In the early days of search, optimizing for a particular keyword was as easy as jamming it (and every related iteration) in a meta keywords tag. As search engines, namely Google, became more advanced they began utilizing other signals like placement of a keyword, keyword density, and backlinks to determine the relevance of a webpage to a query. A diligent SEO could still rank on a particular query if they reverse engineered the right formula for ranking. In 2016, Google introduced Rank Brain which uses machine learning to understand a user’s query and the webpages that will deliver the best results for that query. This leap forward in Google’s algorithm makes it infinitely harder to rank on a keyword by sheer brute force. If a webpage does not match the intent of a user’s query, as determined by Rank Brain, then there is no amount of links and keywords that can make a page rank in the results. The complexity of Rank Brain can be illustrated by viewing search results which appear to be based on hidden keywords. Hidden keywords are the words that the user DID NOT type, yet Google assumes they are a part of the query anyways. 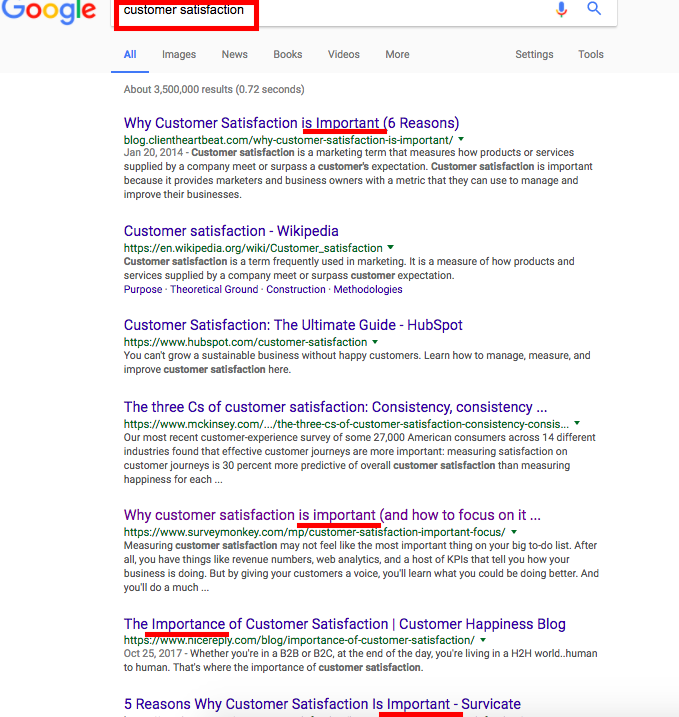 For the keyword “Customer Satisfaction”, Google has determined that a user is searching for a result that informs them of the level of importance of customer satisfaction. The results for the query “customer satisfaction” and “customer satisfaction importance” are very similar. 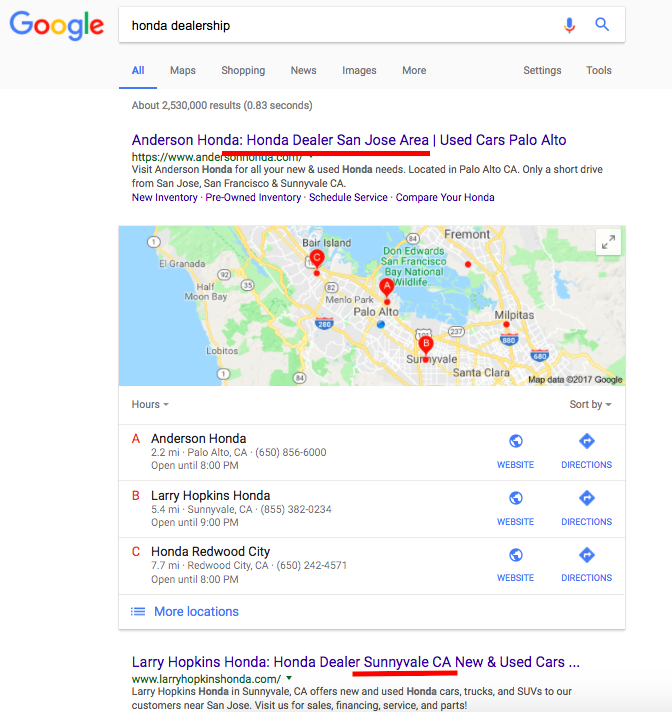 Since Google assumes that when a user searches for customer satisfaction, they really want to know about the importance, they simply append the keyword importance [important] invisibly to the query. Local queries are one of the first places Google started using this invisible keyword. Queries like “pizza” or “car dealership” will typically have the user’s location appended to them invisibly. In the example below, you can see these results showing results as if I have included my location. 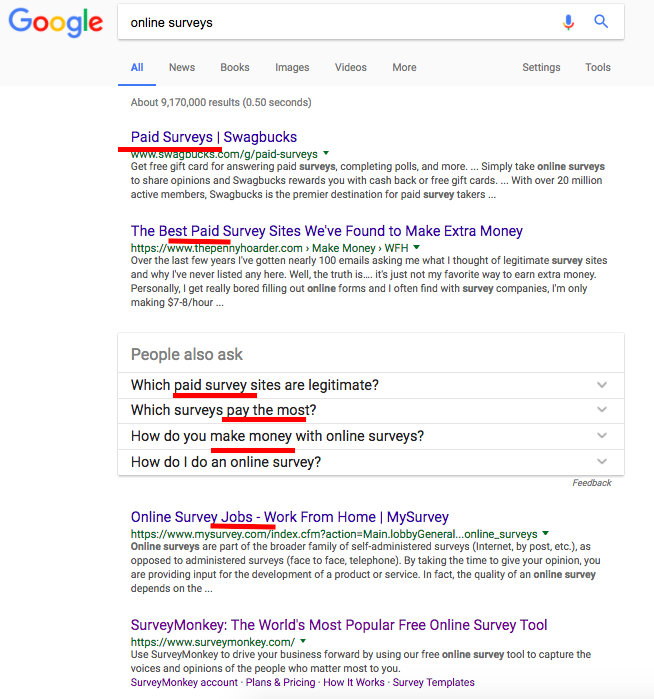 In this final example, Google has determined that someone who searches the keyword “online surveys” (the plural form) is looking to take online surveys rather than create them. Looking at the top few results, it does not look like these sites really even optimized their title tag towards the keyword of “online surveys”. 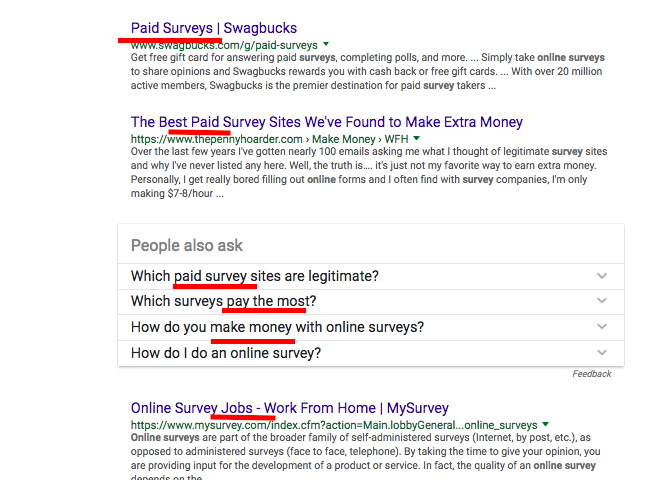 For this query, Google has determined that someone searching for “online surveys” is really searching for “paid surveys” and even in the “people also search” box supports that. Rather than just relying on keyword search volume in deciding what kinds of content to write on a website, you also need to take the next step of understanding what kind of content Google believes users want to see on that query. This information should be utilized both in the theme of the content you write and also in the keywords used on the page. If you optimize for the invisible keyword you just might get a leg up over competitors who did not bother to optimize for the full phrase Google is querying for in their database. Previous Post:ccTLD’s Not the Preferred Way to Localize for Google?